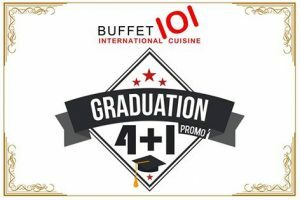 Buffet Promos for Graduates of 2017! This is a great salute to the graduates of 2017! Before you begin the journey to the new chapter of life, here is compilation of treats from five (5) popular buffet restaurants. Graduation day is celebrating your transition from student to graduate and marking the beginning of an exciting new chapter. And it will be more awesome if we celebrate this unforgettable life event with family, friends and most importantly, good food. 1. This promo will run from March 15, 2017 to June 30, 2017. 2. 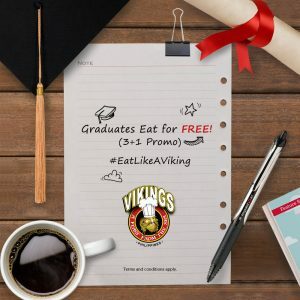 Graduating students of class 2017 get to eat for FREE at Vikings Luxury Buffet. Each 2017 graduate should be accompanied by THREE (3) full paying adults. 3. 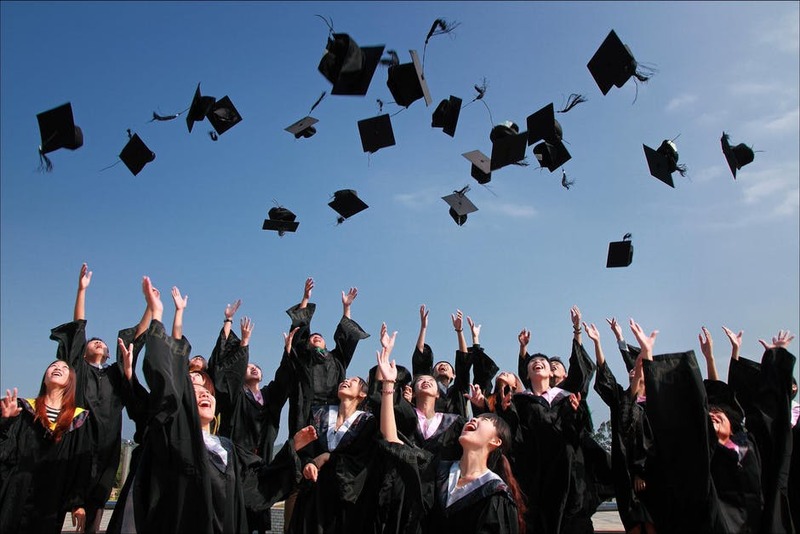 The graduate should present ANY of the following to avail the promo: Diploma, Graduation Photo, or Graduation Program with the graduate’s name/ceremony invitation (all supported by the school ID). 4. 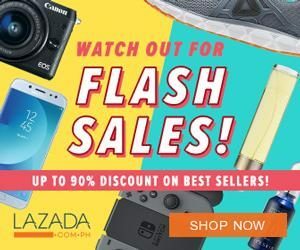 Only those Moving Up, and Graduates of Class 2017 can enjoy this promo (Graduates of Kindergarten, Elementary, and College: Bachelor, Master or Doctor’s Degree). 7. Special Gift Certificates cannot be used in conjunction with this promo. 8. This promo will run from March 15, 2017 to June 30, 2017. 9. This promo is available in all Vikings Luxury Buffet Restaurant branches. 1) One phone number for all branches : VIK-INGS (or 845-4647), or directly call their branch to contact their stores thru landline and/or mobile number. 1. 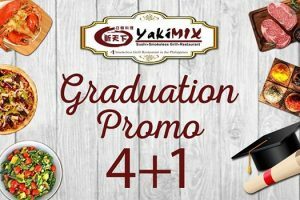 Free buffet for every Graduating/Moving-up student of 2017 who will dine on Graduation Day /Moving-up Day and up to seven (7) days after, in any of the Sambo Kojin restaurants, accompanied by two (2) full paying adult guests. 2. The Graduating/Moving-up student must present to the dining personnel any of the following: Diploma, Graduation/Moving-up photo or Graduation/Moving-up Program/Ceremony Invitation with Graduate’s name (all supported by school ID). 3. Only the Graduates/Moving-up students of Class 2017 (Kindergarten, Elementary, High School, College and Postgraduate) can avail of FREE BUFFET FOR THE GRADUATE. 4. Promo will run from March 1, 2017 to July 31, 2017. Not valid with other in-house promotion or discounts. 1. 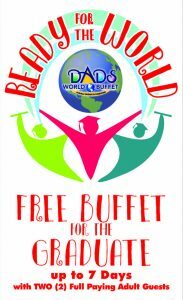 Free buffet for every Graduating/Moving-up student of 2017 who will dine on Graduation Day /Moving-up Day and up to seven (7) days after, in any of the DADS World Buffet restaurants, accompanied by two (2) full paying adult guests. Graduation/Moving-up photo or Graduation/Moving-up Program/Ceremony Invitation with Graduate’s name (all supported by school ID). Graduates of 2017 may eat (1) free buffet at any Buffet101 Nationwide. 1) To avail the promo, graduates of 2017 must be accompanied by minimum of 4 full paying adult rates without any discount/s. 2) Promo is applicable from Mondays to Saturdays (lunch) and Mondays to Thursday (dinner) only. 5) This promo is not applicable on Special, Declared and Legal Holidays. 6) This promo can’t be used in- conjunction with any in-house existing promotions. Mandated 20% off for senior citizens may either avail, whichever is higher. 7) Promo period is from April 01 to May 31, 2017. To avail the promo, graduates of 2017 must be accompanied by minimum of 4 full paying adult rates without any discount/s. Promo is applicable from Mondays to Saturdays (lunch) and Mondays to Thursday (dinner) only. Promo can’t be used in- conjunction with any in-house existing promotions. Mandated 20% off for senior citizens may either avail, whichever is higher. Not applicable on Special, Declared and Legal Holidays. Promo period is from April 01 to May 31, 2017.